I want to tell you about aspens but I don’t know anything about aspens. Not more than you do, I’m sure. That they have gray trunks. That they are tall trees, spindly. They look like a game of pick-up sticks falling, except with leaves. That their leaves have points and thick veins. That these leaves change colors—from green in summer, to yellow and orange and red in fall. That these leaves fall dramatically, one at a time and in clumps in winter, leaving the trunks completely bare. That in spring, naked aspens grow new leaves, after the snow has begun to melt. I can tell you these things about aspens but I don’t know these things in the way you know the palm of your mother’s hand or how to drive to the drugstore in your hometown or how your love likes his or her eggs. I didn’t grow up with aspens. Aspens like cool climates with cool summers. They like high altitudes. They live on mountains. They enjoy the way the winds tussles their leaves. I grew up in Louisiana, where the air is full with hotness and humidity. Still, the landscape is made of trees. Oak trees arch themselves over long thoroughfares. Cypress trees rise out of swampy water, their knees and torsos rising up from the muck. Sweet olive trees cascade their small white flowers, covering sidewalks and yards. Magnolia trees produce waxy dark green leaves and then brown buds that will eventually open into bright white petals. But I don’t want to tell you about oaks, or cypresses, or sweet olives, or magnolias. I came here to tell you about aspens. How when wind hits them, their leaves begin to spin without falling. How these leaves appear to shimmer, as they spin, in the sunlight. How, when you look out on a forest of them, it seems as if a painter has just applied one long stroke of cadmium yellow. How, incredibly, those tall trunks lean, pitch, bend so far to the side, without falling, without breaking. I don’t know about aspens but I do know about moving easily when the wind blows. I know what it means to sway. I know that when a strong wind moves me, I find it impossible to stand still, to quiet myself, to keep myself from fluttering. I know that when the gale hits, I quake from the impact. I wonder if I will withstand the feeling of pressure and of cold. I move. I am moved. I am moving. And even as I bend, even as I swing, even as I undulate and oscillate and stagger, even as I wobble and lurch and reel and roll, I can feel my roots extending down and down, fixed tightly in the earth, I can feel the sturdiness of my trunk as it extends up and down and I know that through this storm, I will hold. On Route 189 from Flagstaff to the Grand Canyon, there are numerous stands of Quaking Aspens along the side of the road, and when they are in full bloom they are truly one of nature’s most beautiful sights. You and Carol are on the same page. 🙂 Thanks, Bob. Even though I had lived in Colorado most of my life, when I moved to the Western Slope I heard a term that was new to me: quakies. Someone’s house was up in the quakies, or the quakies were putting on color. Their popular name is Quaking Aspen. Their Latin name, populous tremuloides (you can see where tremulous and trembling come from) also gives the idea of their particular movement in the wind, as if the whole tree is shaking. The leaves flip back and forth as if coins that are one side silver, one gold. Depending on the temperature and rainfall, the fall color can be spectacularly red and gold. Walking in an aspen grove when the leaves are golden and the sun shines through is otherworldly. 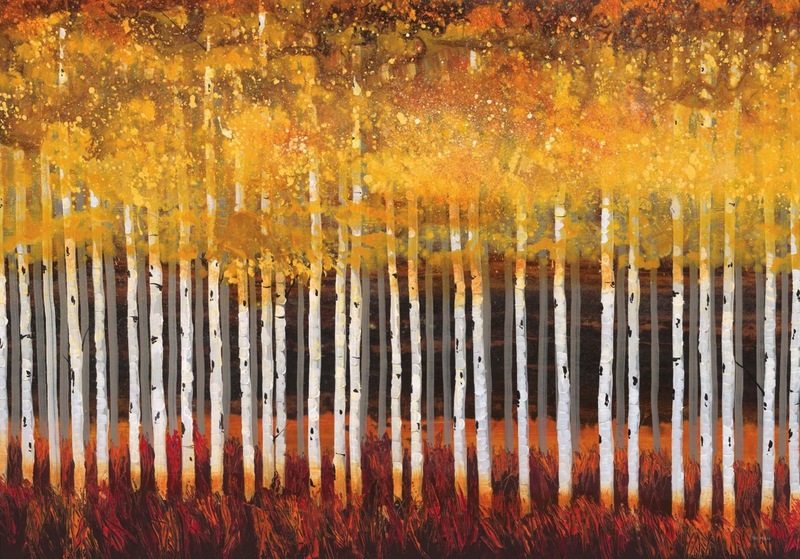 The large groves of aspen also grow from one single root, as a family. Recent research says that trees like this communicate with each other. Maybe they say, be beautiful. Let the wind take you. You say you do not know much about aspens, but you nailed them, as Captain Beefheart was fond of saying “all in the same breath.” Thank you. Thanks for transporting me to Colorado and the swaying Aspens: a beautiful morning meditation. I didn’t know the populous tremula origin which makes me think of our native American reference to trees as standing (& swaying!?) people. In their grove I am struck by their community: ever seen a solitary aspen? But most of all thanks for the deep impact of “through this storm, I will hold”.